In preparing for a week-long family trip to Kona, Hawaii I had done some research, and I heard that the Manta Ray night dive was a good dive. 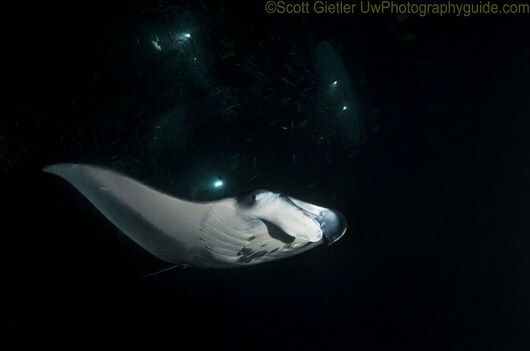 I was told that the Mantas were feeding at night, and were more approachable than during the day. But nothing could prepare me for the fact that we would indirectly be feeding the mantas, and how incredible that could be. I arrived at the Kona Honu Divers boat with my dive gear, including my gloves, hood and 3mm suit, and my camera rig – twin strobes, Nikon D300, Sea & Sea housing, Sola 600 photo light, Tokina 10-17mm fisheye lens – all in my trusty AO Cooler bag. The boat crew got everything prepared on the boat while the customers waited comfortably on shore in lounge chairs. There was a mix of divers and snorkelers on the boat. Once the boat was ready, Captain Frank, who has been working for the shop for over 6 years, gave a thorough briefing. Then he turned things over to our divemaster, Scott, who explained the dive. There would be several other boats at the site, and the divers from all the boats will be in a large circle. Each dive boat will put uniquely colored dive lights on the tanks. Do not touch the mantas. No snorkels allowed for divers. Hold the dive lights pointing upward next to your head. 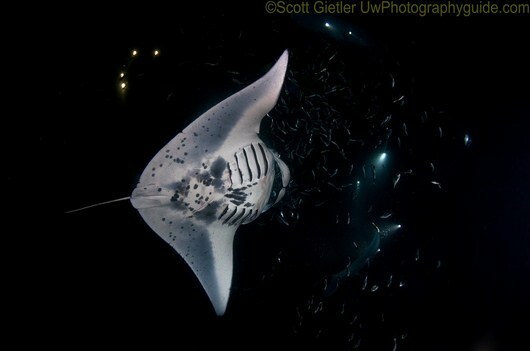 The mantas will feed on the plankton the dive lights attract. Every diver will be given a strong dive light. Our DM would be taking video of the dive, which would be available for purchase after the following day. Scott also told us about Frank the friendly eel that might swim through our equipment, and Charlie the friendly trumpetfish who would nuzzle up close against us. I was really looking forward to meeting Frank and Charlie! Scientists believe there many be 2 species of manta rays, a “coastal” manta ray – normally about 12ft wide, like the ones will see tonight, that live in the same area their entire life, and a larger pelagic manta, 20-25ft wide, like the kind you might see in Bali or Socorro. You can read more here about the differences. I was not excited about doing a dive with potentially 50 other divers. Normally I enjoy seeing only marine life underwater. But soon I was going to find out why this was a good thing. After a 30 minute boat ride, we joined about 8 other boats at Garden Eel cove, near the Kona Airport. The airport area is a secured area, with a very rocky coastline, so you don’t normally see people trying to shore dive this spot. The manta rays used to show up at the Sheraton hotel south of Kona, with the first night dives happening around 1991. This happened until the hotel closed down, and the manta rays stopped appearing. Luckily for the dive operators and tourists, a dive shop called Eco-Adventures discovered that the mantas were feeding north of Kona near the airport, and the rest is history. Once it was completely dark, we all got into the water. The snorkelers hung on to a large surfboard that had strong lights attached to it, pointing downwards. Our dive group swam underwater towards the underwater “ring” setup, where all divers would be in a giant circle on their knees for the entire dive. A circle of stones is setup so the divers are always at the same place. On the way to the circle, we watched a couple 12ft manta rays swim by. The game was on! The number of manta rays grew from 4 to 20 over the next hour. They literally fed off the plankton that was attracted to your dive lights, which means you often had giant manta rays swooping down within a few inches of your head. It was totally amazing. 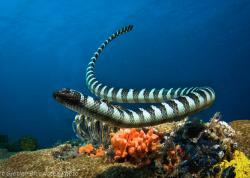 They would swim in open-mouthed, they would do flips and acrobatics in front of you. Five minutes into the dive, I looked down, and Charlie the trumpetfish was nuzzled against me. He actually stayed too close to take photos of, perhaps he liked the shape of my camera rig. 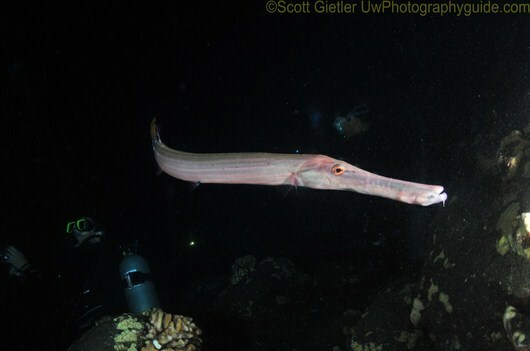 Trumpetfish are normally very skittish, and I could have done an entire dive with Charlie. The circle of divers was very large and never felt crowded. Our group was near each other and I always saw the familiar “red glowsticks” on their tanks nearby. I was actually impressed how well the dive shops work together, and how well the divers behaved underwater. As the dive progressed, things grew more chaotic – in a good way. More and more mantas appeared. 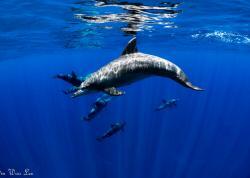 They swam right over divers’ heads, raking in all the plankton they could find. Between the lights at the bottom, and the lights from the snorkelers, they had quite a bounty of plankton. A large school of fish positioned itself in the middle of the water column, trying to stay out of the way of the manta rays’ mouths. I was told if a manta takes in a fish, it will gently spit it out. I had thought the dive was going to be 40 minutes long. When the DM signaled that it was time to swim back to the boat, I was pleased to see that we had been underwater for 60 minutes. I had taken 350 photos. One of my strobes had stopped working near the end of the dive. I could have stayed down all night. 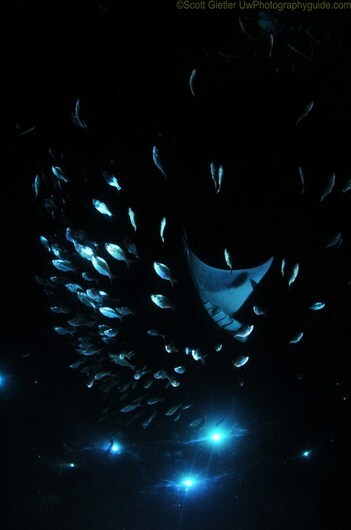 As I was about to get back on the boat, I saw several mantas swimming around a blue light hanging off our sister boat. This was a unique opportunity, and I swam over to them for 5 more minutes, taking photos of mantas “in the blue”. Back on the boat, our DM Scott showed us on a tablet the names of the 20 mantas that appeared. 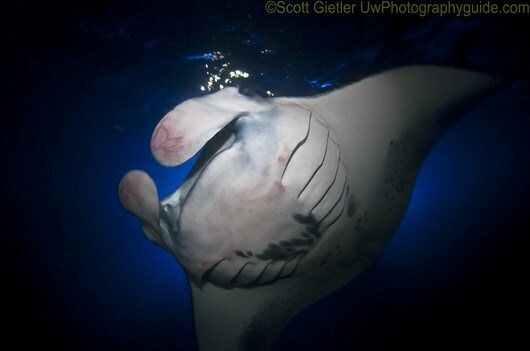 You see, manta rays can be uniquely identified by the patterns on their belly, and Scott knew each one he saw that night. I was quite impressed! 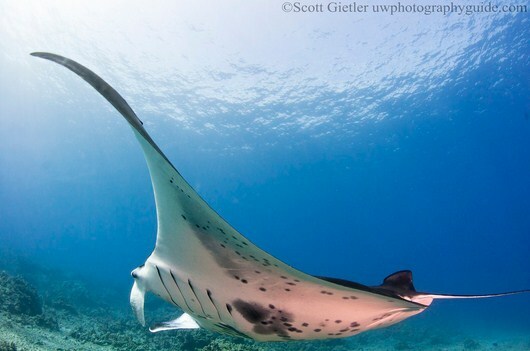 There are almost 200 mantas identified that live and stay in the Kona area. I later found out that sometimes no manta rays show up. It is rare, but it does happen. There is an alternate site to go to when this happens, south of Kona. Having over 20 show up was exceptional. I think the record is around 36 rays. 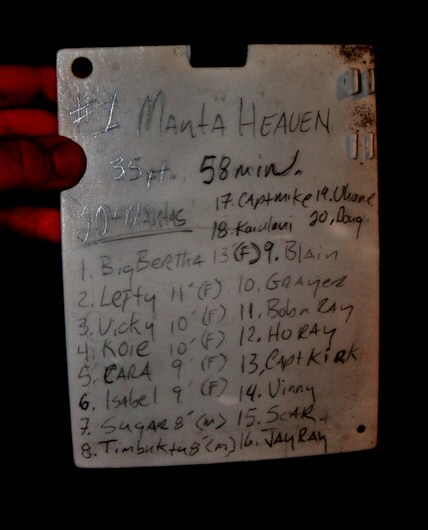 DM Scott's list of all the mantas that visited. We had 20 distinct mantas on this dive. All these mantas stay in the Kona area year-round. Many thanks to Kona Honu Divers for running a very professional operation, with a well trained crew who was been with them for several years, which is always a good sign. If you dive with them, try to get out with Bo Pardue, he is an excellent underwater photographer who can help you get the best shots. I knew achieving focus on the manta rays at night would be a challenge. So I decided to pre-focus my rig and some rocks a few feet away, and then switch to “M” (manual) focus mode using the C/S/M switch of my Nikon D300. This meant there would be absolutely no focus delay when I pressed my shutter – very important since the manta rays will swoop in quickly. Using an ultrawide fisheye lens, and shooting at a larger depth of field meant that most of the shots would hopefully be in focus. You want to use as wide of a lens as possible on this dive. My Tokina 10-17mm fisheye lens was perfect, and I often shot at the widest setting. Since I was shooting very wide, and there was plankton in the water, my strobes were far out, pulled back, and pointed outwards. Backscatter is always an issue when shooting at 10mm, if the strobes aren't out & back far enough. The exception was when I wanted to light up the inside of the manta’s mouth, I pulled my strobes closer in and pointed them forwards. 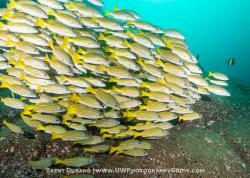 This is the kind of dive where you are glad you have two strobes. To get more depth of field, I set fixed my aperture at f10 for the dive. 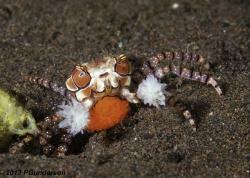 Getting enough DOF was especially important since my focus was fixed throughout the dive. I wanted to shoot quickly, but I wasn’t using strobes that recycle almost instantly like Ikelite strobes. But I also wanted as much strobe power as possible. So I turned my strobes down ½ stop from full power, which helps the recycle time a lot, and also extends their life - and left them at the power for the duration of the dive. 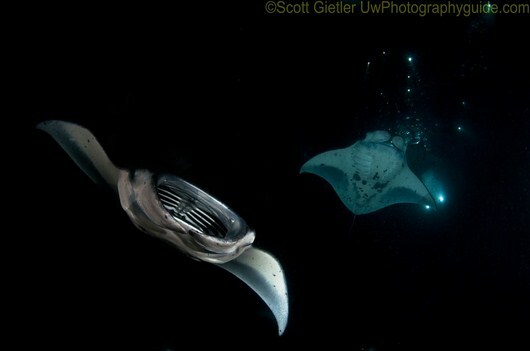 Since my aperture and strobe power were fixed, I adjusted my ISO until the manta rays were getting exposed correctly. ISO 500 to ISO 640 generally gave decent exposures that were not over exposed. Once ISO was fixed, I adjusted the shutter speed until the dive lights in the background looked the way I wanted them too. I think it is important not to cut off parts of the manta ray. I was constantly using my zoom ring to get the proper composition while I was shooting through the viewfinder. My shots were taken at 10mm and 17mm, but more often at 11mm,12mm or 14mm. Open wide! 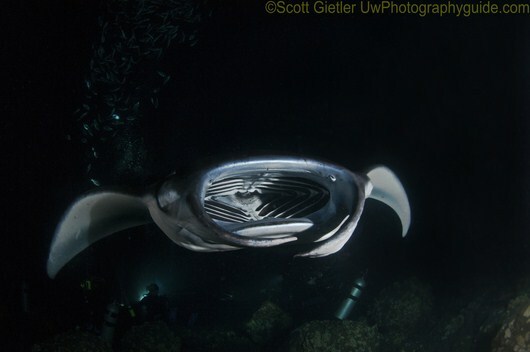 I had to pull in my strobes and point them forward to light up the inside of the Manta's mouth. 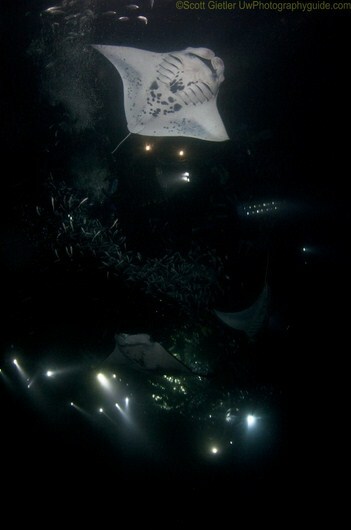 The place where you see the mantas is at 35ft depth. Water temps are usually 75-79. Ask what the policy is, if no manta rays show up. Some shops may offer a free or discounted 2nd trip. This is not common, but it can happen. The manta rays are not seasonal, they are seen year round. 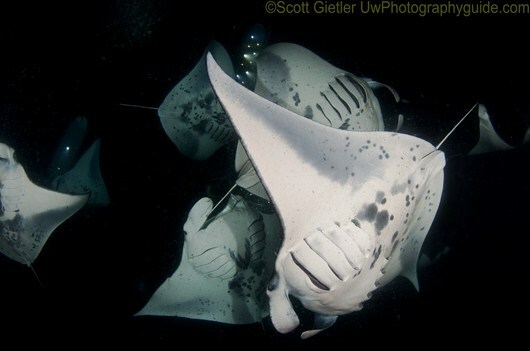 Ask if you spend the entire night dive with the mantas, or if you swim around the dive site for half the dive. I'm not saying one is better than the other, but as an underwater photographer my personal preference is max manta time. Surf / surge can sometimes be up in Jan/Feb, but in general the dive site and Kona in general is quite protected. Any time is a good time to dive Kona. The months with fewer tourists (when I like to visit places) are non-holiday periods in April / May and Sept-Nov. Submitted by Anonymous on Tue, 2012-10-16 14:14. Do you think you'd still be able to get decent photos from the Manta snorkel? My parents are visiting us, and they would like to do the snorkel rather than the dive. I would really like to get good manta photos, though. Is there still a good chance for great photos, while keeping my parents company? Submitted by Anonymous on Tue, 2011-05-10 19:42. 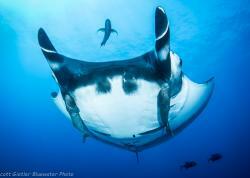 First off, great article about the Kona mantas! My wife and I are currently planning a trip to Hawaii and I told her this dive is a MUST on our to-dive list! One thing you didn't share in your photography tips is whether or not you used the focus light that was part of your gear. If so, what did you have it set to: red light or regular white light? Did you have to angle the light to cut through the plankton or did the strobes wash out the focus light when firing? As always, thanks for another great review! The pictures are incredible! Submitted by scottg on Wed, 2011-05-11 02:07.
thanks for the comments! I used a sola 600 focus light.. however, since my camera was on manual focus, the focus light was simply lighting up the dive, not helping the camera acheive focus, and I could have turned it off. I used it in white mode. I did take a few photos with the red light on, and you could see the red in the photo a little bit. Which means the white light is blending in with my strobe light in the photos. I didn't angle the light and I guess I got lucky with respect there not being too much plankton in the water in my immediately vicinity. A dive well worth it. Submitted by tdmajor on Mon, 2011-05-09 13:08. I made this dive in the spring of 2006 while at the island for a friends wedding. It was everything you mentioned. We counted 18 different Mantas on our dive. I must say that I didn't see Charlie during our outing. It was really exhilarating watching one of these monsters coming right at your head with their mouth open and then skimming the top of your head as they would loop around. We had so much plankton and shrimp drawn in by the lights, that they were getting it in our mouths around our regulator. I would recommend this dive to anyone who will be out their. Thanks for the memories. Submitted by Anonymous on Mon, 2011-05-09 10:55. Wonderful article, Scott. Mahalo for joining us in Kona and having such a great time with the mantas and enjoying the many diving opportunities available on the Big Island. Look forward to seeing you again in the future! Submitted by Anonymous on Sat, 2011-06-18 05:37. 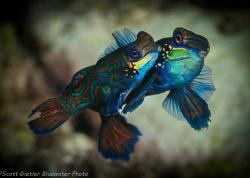 Great article Scott, I can't wait to dive Raja Ampat in Nov and try some of your tips.